Ripped Recipes - Oven-Baked Spicy Garlic Chicken Fajita Bowl. 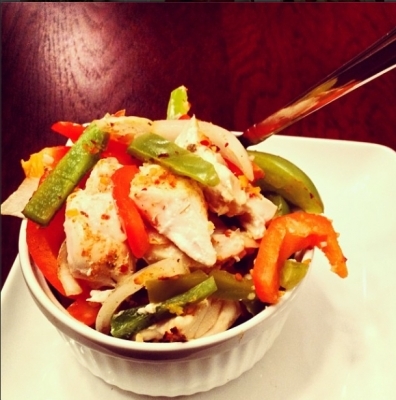 Home » Recipes » Dinner » Oven-Baked Spicy Garlic Chicken Fajita Bowl. Oven-Baked Spicy Garlic Chicken Fajita Bowl. Ingredients (4 servings): 4 small chicken breasts, 1 red bell pepper, 1 green bell pepper, 1 small white onion, 2 tbsp. Mrs. Dash Chipotle seasoning, 1.5 tbsp. minced garlic.